Visa requirements are subject to change at any time. We advise you to call your consulate for up-to-date information before you travel. 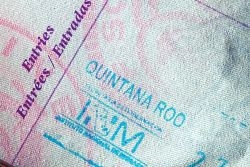 When arriving in Cancun, Mexico, you will need to produce an up-to-date passport as well as a visitor’s permit, known as the FMM ‘Forma Migratoria Multiple’. You can get this free of charge from your travel agent, airline or at your point of entry. The obligatory tourist fee of US$22 is included in your airfare, or if you are entering by land, you must pay the fee at a bank in Mexico at any time before you enter the frontier zone on your way out of Mexico. When you arrive at Immigration at passport control, you will be asked to provide your passport, FMM and possibly the proof of necessary economic means and a return ticket. You may also be asked about the purpose of your trip, how long you will be staying and if it is your first time in Mexico. After the Immigration officer has stamped your FMM, you must keep this in a safe place and not lost it as you will be asked this document when you depart Mexico. We suggest you attach it to your passport. You are now entitled to stay in Mexico up to 180 days. Some Immigration officers may put a lower number on your FMM card unless you tell them specifically what you need. We advise you to ask for more days than you actually need incase of delays or plans change. Tourist cards and fees are not necessary for visits shorter than 72 hours within the frontier zones along Mexico’s northern and southern borders, but be sure to confirm details when you reach the border. Andorra, Argentina, Australia, Austria, Belgium, Canada, Chile, Costa Rica, Cyprus, Czech Republic, Denmark, Estonia, Finland, France, Germany, Greece, Hong Kong, Hungary, Ireland, Iceland, Israel, Italy, Japan, Latvia, Liechtenstein, Lithuania, Luxemburg, Malta, Monaco, Netherlands, New Zealand, Norway, Poland, Portugal, San Marino, Singapore, Slovakia, Slovenia, South Korea, Span, Sweden, Switzerland, United Kingdom, Uruguay, USA and Venezuela. For those who do need a formal visa to enter Mexico, this may take several weeks to process and you may be required to apply in your country of residence, speak to your consulate about this.